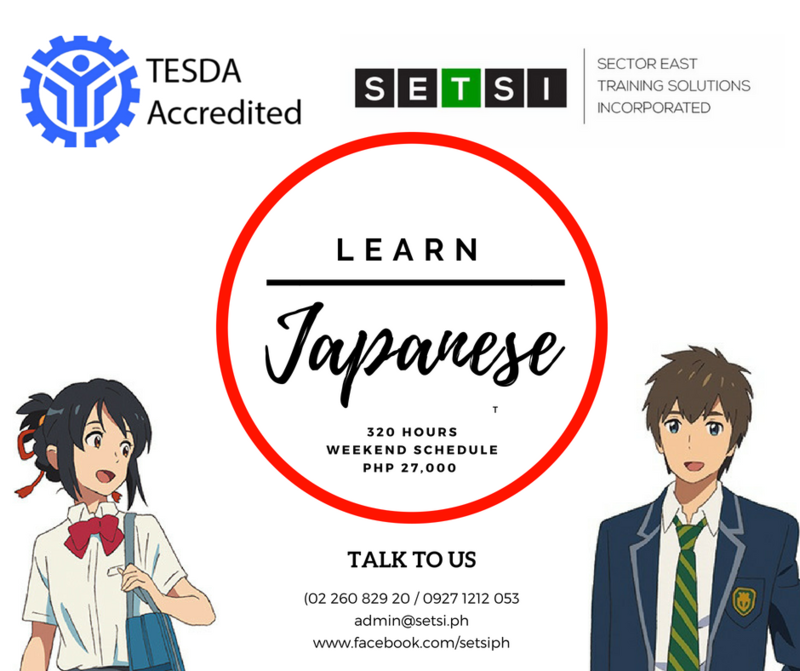 Sector East Training Solutions Inc. (SETSI) is a Technical Vocational Institution accredited by TESDA for Japanese Language and Culture Level 2. Our school is located at Sta. Elena, Markina City. SETSI is opening schedules for Japanese Language and Culture. Learn from our linguistics expert with years of experience teaching Nihongo. At the end of the program, the students should be able to read, write, and speak basic to intermediate Nihongo. The diplomatic landscape between Japan and Philippines has never been better. Over the years, many Japanese firms have invested in the Philippines to do business. Having the necessary skills and knowing the Japanese language is a significant leverage for any job seekers who wish to engage in a Japanese company. BPO industry is also one thriving sector in country. Having people learn Japanese language broadens the business opportunity of the company. On the individual capacity, knowing Nihongo increases the employability and significance of the person. Whether it is through a big company, or individual work engagement, having to know Japanese Language gives you edge over the competing workforce. There is also a huge demand of foreign workers in Japan. The industries the are opening doors are - health care, agriculture, engineering, and industrial workers. With the coming 2020 Olympics, we can expect Japan economy to fully blossom. It means more opportunities for employment in Japan. Japanese Language is not as hard to learn as you think. You can get by without knowing the full hiragana, katakana, or kanji characters. Sentence construction is simple. With our proven approach, you will be able to converse in basic Nihongo in no time. Watch your favorite anime without sub titles. Order straight out of the menu from your favorite Japanese restaurant and know what you are getting. Travel to Japan with confidence. Do your employment interview with a Japanese firm in Nihongo. Impress your significant other. There are tons of reasons why Japanese Language is fun. By the end of the program, the student shall be able to read, write, speak Nihongo. Our program will be using Genki Nihongo modules and Minano Nihongo Modules.